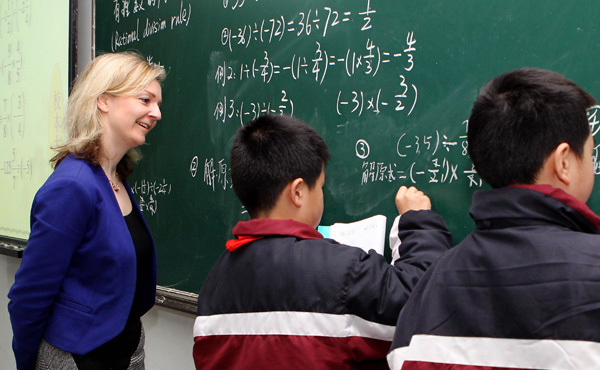 The Chinese "mastery approach" to math teaching is set to roll out in more than 8,000 primary schools in the United Kingdom, with funding of up to 41 million pounds ($54.3 million), to bring pupils up to par with their Asian counterparts. Children as young as 5 will be required to practice sums and exercises, and they must master each concept before moving on to more difficult material. The move comes after international tests showed that Shanghai students ranked on top for math in the Program for International Student Assessment in 2012, and 15-year-olds in China are three years ahead of their English counterparts in their ability to solve math problems. Since then, Britain, whose students ranked 26th that year, has welcomed over 120 teachers from Shanghai to share the secrets of their success in the project, which the British media have dubbed "Shanghai Maths". Speaking at the Advisory Committee on Mathematics Education last week, Nick Gibb, the UK schools minister, said the Shanghai style of math should become a standard fixture in England. "We are seeing a renaissance in maths teaching in this country, with good ideas from around the world helping to enliven our classrooms. "The significant expansion of the south Asian (including Shanghai, Singapore and Hong Kong) maths mastery approach can only add to the positive momentum, with thousands more young people having access to specialist teachers and quality textbooks," the minister added. Gibb is confident that the efforts will ensure young people are properly prepared for further study and that the too-often heard phrase "can't do math" is consigned to the past. Lyu Jiexin from Shanghai Normal University, also a senior coordinator of China-UK math exchange programs, believes the new policy is not a mere copying of Chinese math teaching, but is instead a part of the British government's overhaul to improve the standards of math education. With the growing influence of the international test, more countries are learning from the top performing nations in a bid to improve the competitiveness of their education systems, Lyu said. "The plan reflects the government's full commitment to its math reform and demonstrates the important role that education exchange and collaboration play in that regard," he added. However, some critics were skeptical of the program, worrying that the students will not be able to master fundamental ideas merely through drills and repetition. Charlie Stripp, director at the National Centre for Excellence in the Teaching of Mathematics, said teaching math mastery is not about rote learning and drilling, although it certainly results in pupils knowing and being able to recall multiplication tables and other key number facts. This represents an important foundation for learning and using math, Stripp said.